A stable was the perfect place for our Savior to be born. Let’s celebrate His birth with the three Kings, stable animals, and Joseph and Mary. A sophisticated mix of black and white and colorful blends will make this Christmas a perfect, peaceful and joy-filled one. 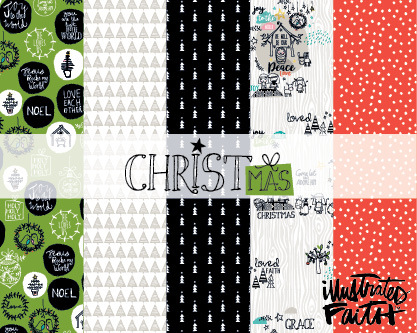 The CHRISTmas collection includes five double-sided patterned papers, one embellishment paper, coordinating cardstock stickers, washi stickers, Paper Pieces,™ 6x8" paper pad, Tabbies,™ clear stamps, Designer Clips™ and Gift Tags. Plus, all new products including a 2x7" Tip-Ins,™ paper pad with list prompts and quotes that fit perfectly in journaling Bible margins and a 6x8" Clear Cuts™ transparency pad with icons and patterned pages you can layer with other papers.